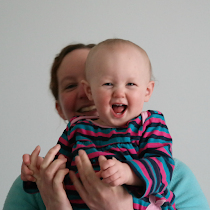 A year ago, I wrote about our decision to move MM out of her cot and onto a "floor bed". One year on, I firmly believe that this has been one of the best parenting decisions that Steve and I have made. We get asked a lot of questions about how/whether/why floor beds work, so I thought I'd pull them all together into a post. It can happen. The first few nights, she fell out two or three times a night; she fell out about once a week for a couple of months after that. 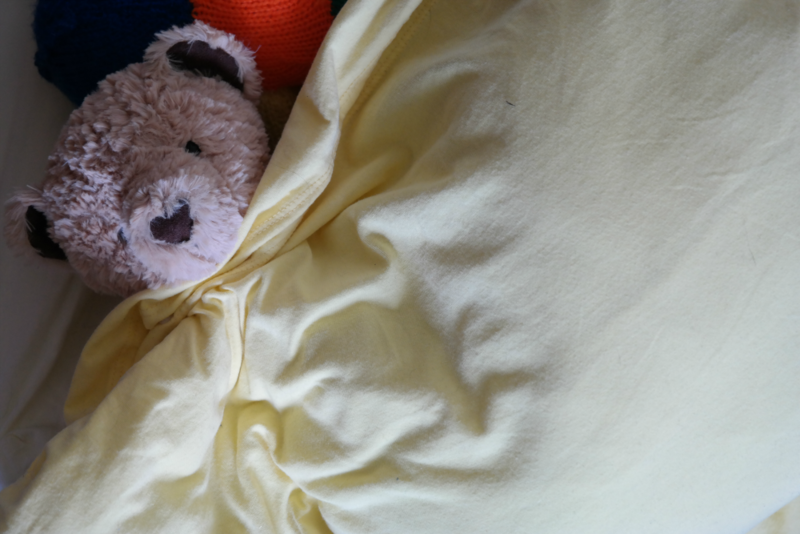 But falling off a mattress is a matter of six or seven inches - when your child's asleep, they're floppy and very unlikely to hurt themselves (although you could pad the floor around the mattress, if you were really worried). Since those first couple of months, she has only fallen out twice. In fact, it's so rare that, at fifteen months, we moved her onto a single bed and didn't bother with a bed guard. Crucially, she can climb back in to her bed, which gives her an extra little bit of independence - and most of us know how much toddlers value being able to do things by themselves! How do you stop her roaming the house in the middle of the night? We have a gate across her bedroom door. We only ever close this at night. How do you stop her climbing on her bedroom furniture/playing with sockets/otherwise endangering herself in the middle of the night? The same way we would have done if we'd waited a year and taken the side off her cot at the standard time: most of the furniture in her room is toddler-height; the one high surface (her wardrobe) is not next to anything she could climb onto; there are minimal hard angles and no accessible glass. We get asked about sockets a lot so I'm going to take a moment to clarify that UK sockets have been designed to be child-safe; in fact, UK sockets are safer WITHOUT SOCKET COVERS - we have taught MM that they are not for playing with but that's just an extra precaution. So, basically: toddler-proof the room. I could (and probably, at some point, will) write at length about how important I think it is for a child's room to be treated as THE CHILD'S ROOM, not just a convenient place to store nappies, vests and sleeping infants. Their room should be somewhere they can play safely, unsupervised and - as far as the layout of your home allows - as often as they choose. How do you stop her getting out of bed? We don't. When she wakes up and [believes she] needs us, she gets out of bed and walks to her bedroom door. But she is calm when she does this; she goes back to bed without objection. In her case, the alternative was for her to stand up in her cot, screaming and trying to climb over the bars - it was a lot harder to settle her back down when she was in the cot, both because she was less cooperative and because it was physically more difficult for us to reach into a cot than it is for us to kneel beside a bed (or - if we're really tired or she's really upset - lie down on it beside her). As for getting out of bed to play with her toys or read books, her room is very dark at night and she can't reach the light switch, so it's pretty unlikely to happen. I do remember having an agreement with my parents that I could read for as long as I wanted, as long as I stayed in my bed, and we intend to take a similar approach with MM. It also helps that she loves her bed. Properly loves it. Not the necessity of sleep but the actual bed. She climbs on it, bounces on it, plays on it (putting her toys to bed has been a favourite game for months, as is instructing other people to fall asleep on top of it) and reads on it - it's somewhere with positive associations for her so it's somewhere she's happy to be. Can you sleep train with a floor bed? I imagine you'd find it difficult - you can't force the kid to stay in the bed. I'd advise getting bed slats to raise the mattress off the floor slightly - it's preferable to have some airflow underneath it as there's a chance of mould otherwise. We didn't actually do that which is one of the reasons we moved her onto a proper bed at fifteen months. The other reason we moved her onto a bed was that I found it quite tough on my knees, kneeling beside the mattress all the time. However, this was still preferable to the back ache I was getting from leaning over her cot! Are there any other positives? Quite simply: it's nicer. I hated MM being in the cot - it was difficult for me to reach her, impossible for her to reach me, and the act of shutting her away behind cot bars was so far from the loving, cuddling, emotionally accessible parenting I wanted to do that it often reduced me to tears. Bedtime and night wakings are now calm, affectionate times rather than battles and there's no understating how happy that makes me. It also saves you from having to transition your kid from cot to toddler bed, toddler bed to big bed, and it saves you the cost of a toddler bed and little sheets. Floor beds are not for everyone. If you're intending to sleep train, they're probably not for you. And some kids may not take to them - or make not take to them at the time you first want to try. But I'm a convert. It's the perfection option for us.